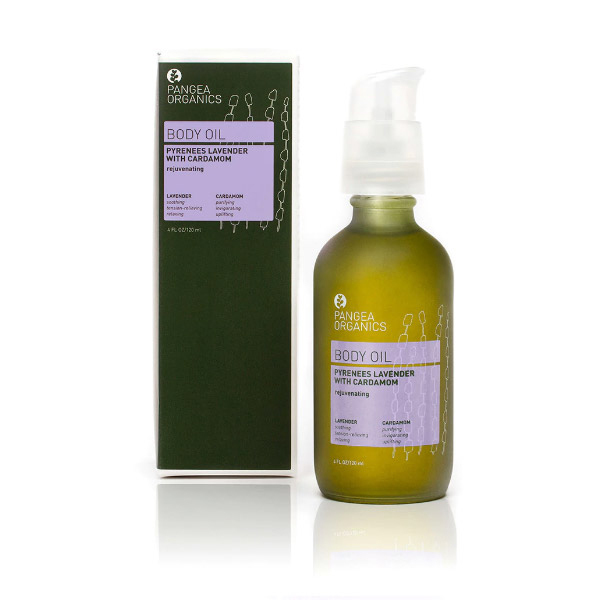 This Certified Organic Body Oil is ideal for therapeutic massage or simply for superior hydration. Drenched in the essence of Mediterranean sunshine, Pangea’s lavender is a sweet, herbaceous savior for tired bodies and minds. Blended with warming and spicy Cardamom, it becomes a relaxing and tonifying elixir that invigorates the senses and nourishes on all levels. Pangea’s luxurious, organic, anti-aging Body Oil is rich in bio-available essential fatty acids and antioxidants and is formulated to provide optimal hydration and nourishment for your skin while absorbing quickly. This blend is perfect for both massage and everyday rituals of self-care to keep skin looking youthful and feeling soft. Apply after bathing while skin is still damp, or try adding a few drops to your favorite Pangea Organics Body Lotion. May be used anywhere on the face or body; ideal for pregnancy and children. Ideal for therapeutic massage or simply for superior hydration. Apply after bathing while skin is still damp, or try adding a few drops to your favorite Pangea Organics Body Lotion. Add a few drops of oil to your shampoo or conditioner for silkier strands and a wonderful scent. Blend oil with your Body Lotion for a youthful glow and extra hydration. Smooth out rough patches on knees and elbows by applying a drop or two of extra oil onto those places a few times a day. When using our Body Polish, apply a layer of Body Oil over the top for a super boost of anti-aging hydration. HELIANTHUS ANNUUS (SUNFLOWER) SEED OIL*, SIMMONDSIA CHINENSIS (JOJOBA) OIL*, SESAMUM INDICUM (SESAME) SEED OIL*, OLEA EUROPAEA (OLIVE) OIL*, COCOS NUCIFERA (COCONUT) OIL*, LAVANDULA ANGUSTIFOLIA (LAVENDER) OIL & LAVANDULA HYBRIDA GROSSO (LAVENDER) OIL, CITRUS AURANTIUM DULCIS (SWEET ORANGE) PEEL OIL & ELETTARIA CARDAMOMUM (CARDAMOM) OIL, MIXED TOCOPHEROL (VITAMIN E) *ORGANIC INGREDIENTS. THIS PRODUCT IS VEGAN AND GLUTEN-FREE. ** **MANUFACTURED IN A FACILITY THAT MAY PRODUCE PRODUCTS THAT CONTAIN GLUTEN. Rich in bio-available essential fatty acids, skin-beneficial vitamins and incredible essential oil aromas, this body oil is the perfect remedy for dry skin and tense muscles. Five organic, food-grade oils comprise the base of this nutritive blend offering superior glide for massage and luxurious hydration for the body. These precious, cold-pressed oils absorb deeply and efficiently to deliver healthy, silky smooth skin. Made sans almond oil, this blend is suitable for those with nut allergies and perfect for organic purists. Organic and readily absorbable; softening for you and easy on Mother Nature. Aaaahh, now that feels good. Sunflower Seed Oil is extremely high in vitmain E and Linoleic Acid [Omega 6], contains vitamin A, D and E and is rich in Calcium, Zinc, Potassium, Iron and Phosphorus. It creates a protective barrier on the surface of the skin that hydrates and protects. Easily absorbed, its high content of essential fatty acids increases hydration by reinforcing cellular vitality, thus encouraging moisture retention.